Many swimmers do not have the luxury to train in 50 meter pools, however, some of us do have the option and still choose not to do so. 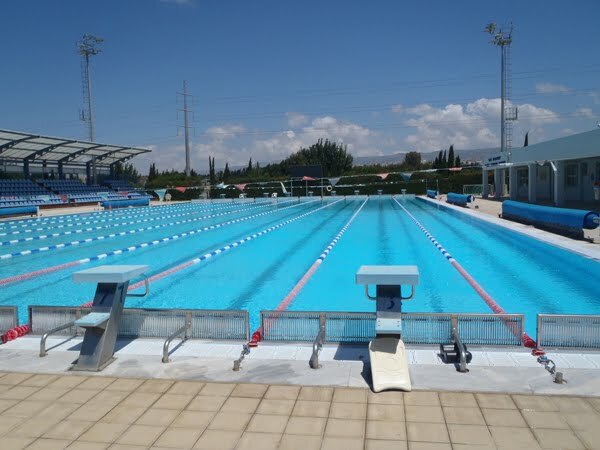 The following article will give you some information about 50 meter pools and Olympic size pools in terms of what it could mean to your swimming success. This is a guest post by Matthew White (@serious_square) a swimmer and water polo player based in the UK. During my time with the Great Britain Junior Water Polo Team one of the many places I had the privilege of playing was Barcelona. 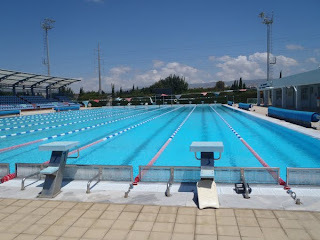 When I was there in 2001 there was a rumour that there were more 50 meter swimming pools in Barcelona than the whole of the UK, a statistic that we all knew could easily be true but were never able to verify. What may have been the actual fact was that there are more 'Olympic size pools' in Barcelona than in the whole of UK. This is because in 2001 there appears to have only been one, Ponds Forge International Sports Centre. This was the only pool to meet the 50 meters by 25 meter (10 lanes) standard. In 2011, there are now 3 more official Olympic sized pools in the UK: London Aquatics Centre (the venue for the 2012 summer Olympics), Sunderland Aquatic Centre and the John Charles Centre for Sport, in Leeds. Since 2001 there have been a number of swimming pools built that are 50 meters in length, notably Manchester Aquatics Centre, Cardiff International Sports Centre and the K2 near Gatwick airport to name just a few, we seem to be getting the idea that for our swimmer athletes to compete at the very top level they need to be training and racing in full length swimming pools. Just as it would be ridiculous for a 100 meter runner to sprint 50 meters, turn and run back, the dynamics of training in a 25 meter pool are completely different to that of a 50 meter pool. In Australia, a country with a population a third the size of the UK they have built 47 Olympic Sized swimming pools and they consistently produce swimming and water polo teams that compete regularly with the very best in the world. Does their success boil down to having more quality swimming facilities? I would argue that it is an important factor, however, probably not the only factor. Swimming is amongst one of Britain's most participated sports, so the pool of potential athletes probably matches or exceeds that of Australia, therefore, nurturing top athletes with the very best swimming facilities is very important. Looking at UK swim teams performance in the pool since the Sydney Olympics in 2000 the theory of an increased number of 50 meter pools aiding top level performance could gain a more weighted argument. The table shows an increase in medals between 2000 and 2008, plus in 2008 British swimmers made more finals than any other Olympics before. Looking at this purely quantitatively, more pools = more medals – but it is not as simple as that. What will happen in the 2012 Olympic Games in London is still to be decided and your guess is good as mine. Will the team GB break records and bring home more medals than before? One might argue other factors contribute to a country like Australia's success, firstly, the climate is far warmer and from my own experience potentially Olympic standard athletes get fed up with getting up on a cold dark mornings and training for two-hours before school – therefore just quit or 'burnt out' as it is called. I don't know what the 'burn out' rate for Australian athletes is, but personally I find it far easier to getting up to a bright warm morning as opposed to a cold dark one. So one could argue, to be an Olympic swimmer in UK is much more psychologically challenging than in warmer and sunnier countries like Australia. Other factors have to include training strategy, when Bill Sweetenham came in as National Performance Director of Team GB after the unsuccessful 2000 games, he employed what was known as 'tough love'. The details of his methods are unknown to me, however, what we do know is that he was heavily involved with Australian swimming before he joined Team GB and therefore must have been the same. We also know that those methods helped improve the GB swimming teams world performance. There are always going to be more factors than 'the quality of swimming facilities' and accessibility. But looking at the number of recent pools built in the UK, someone must be realising their importance, both for elite athletes and for the general public. For me, the increase in 50 meter pools has directly influenced UK swim team's national performance and I would be interested to hear from readers about their own country. The future seems quite bright for swimming in Britain, and no doubt the 2012 Olympics effect will go further in increasing funding and participation for the next swimming generation. At an age still young enough to compete, but getting nearer to coaching 'age' I personally am quite excited about the potential new facilities and interest in aquatic sports has received and where they can take us in the future. More about Matthew: He writes swimming and pool related articles for Aspect Pools who sell everything to do with aquatics from swimming pool chemicals to garden swimming pools. From Swimator Blog: If you have the option to train in 50 meter pool, you should definitely jump on the opportunity. Practicing in 50 meter pool has many benefits Here are just a few. It is much harder to swim as one cannot rest on the wall every 25 meters, so you will get stronger over time and coming back to the 25 meter pool for training will feel like a walk in the park. You also have more time to practice the miscellaneous swimming drills since you do not have to loose focus with too many wall turns. 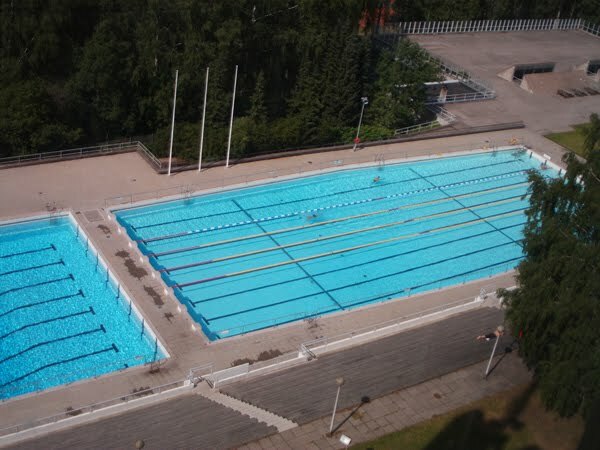 Also, usually, there is more space in the 50 meter pools, so you have less swimming traffic in the lane. If your main swimming goal is to improve in open water swimming or triathlons, 50 meter pools should take up majority of your indoor training. However, that said, it is not a good practice to only train in 50 meter pool as it is quite easy to loose speed and loose the grip on your turns. So make sure you strike a good balance between your training locations. Happy swimming! Stereotypically, I find triathletes to be very self-motivated athletes always pushing their limits in whatever they do. And rightly so. In order to achieve competitive level in all the three sports combined, triathletes have to manage their workout regimes very tightly, so they have time to practice and improve in all of the sports. Talk about time management skills :). This, however, also brings with it a big challenge for many triathletes when it comes to improving in swimming. Running and cycling are very similar sports in the sense that if you run or cycle for longer periods or more often, you are bound to improve as the motion is not as complex as in swimming and the activity is on dryland which we are more accustomed to. Going for weekend 6 hour rides feels very tough at the beginning, but after a 3 month period of continuous riding, it suddenly does not feel so bad. One cannot, however, simply use the same principle in swimming. If you enter your swimming workouts with the following idea in your head, "I will swim as hard and as much as I can and I'll improve" you are already setting yourself up for a failure. Swimming smarter and not harder is the cliche that gets repeated over and over, but it is actually very much true. Swimming needs a bit of a different, more scientific approach to training. You cannot simply turn your brain off when you swim and hope for the best. The swimming movement is such a complex matter that it needs to be broken down into parts and these parts need to be practiced over and over before they can be slowly put together again. Similar to babies finding their hands and practicing putting them in their mouths and practicing their first steps. Human bodies weren't originally built for water, so we need to work extra hard to be efficient swimmers. To break down swimming into parts, we use what we call in swimming lingo "swimming drills". Each swimming drill focuses on a specific small aspect of the swimming stroke with the goal of improving the overall stroke. Some drills are easy, and some quite difficult, but they all have a purpose. For example, we could have a side balance drill where a swimmer only kicks on his/her side to practice correct body line position, increase core body strength and overall ballance in the water. Or to help with the underwater catch we could use the freestyle one arm drill where the swimmer swims freestyle only with one arm while the other is pointing forward or by the body. There are hundreds of swimming drills for every stroke out there and the best coaches incorporate them into their practices every day. So why shouldn't you? I know what some of you might be thinking: well, if I swim slower with one arm or just kick on one side, I don't feel I am working as hard as I do when I train in running or cycling. Sure, your heartrate might not be as high, so you feel like you are wasting your time since you are swimming slowly or you might get bored as your body needs that rush of exhaustion all the time for you to feel that the workout was worth it. Or you might be thinking that I don't have time to worry about this, I just need to swim as I don't have enough time to master all three sports and, I have to swim as much as I can. If you belong to this category of triathletes and you train in this way, you are just asking for trouble, especially when it comes to improving in your swimming. Not improving your technique by incorporating miscellaneous swimming drills into your swim routines, is a bit like running or cycling with untied or unstrapped shoes. You can tie them at any point you want, but you do not and you keep running or cycling with them untied even though you'd run much faster if you took the time to tie them. You can perform swimming drills during your workouts, but you do not because your mind and stubbornness get the better of you. The same problematic behavior can apply when swimming in a group, on a masters team or in a lane with other lap swimmers. Your competitiveness or pride gets the better of you and you try to race the person in the next lane or pass a slower swimmer in front of you. This competitiveness spirit is awesome and it is what makes you better in one way (so don't lose it), however, it also cripples your ability to slow down and properly understand the different movements your body is making in the water. The same goes for choosing what time intervals to keep during your swim practices. Many of you may feel you have to keep up with the faster swimmers all of the time and therefore cut your rest or interval workouts so you can stay with the group. As much as this is very good practice once in a while, most of the time you are damaging your swimming more than you are helping it. First, the intervals and rest are there for a reason: if you cut them short you are suddenly practicing on a different heart rate level which has a different effect on your body than planned by the workout. Second, since you are working harder than you are supposed to, your swimming technique deteriorates and your stroke suffers. Next time you are doing your workout or are in the pool just cruisin', take these words to heart and do me and most important yourselves a favor. Start to think about your stroke. Swallow your pride, learn to think like a swimmer (not a triathlete) when you are in the pool and swim at your own speed and utilize swimming drills in your workouts. 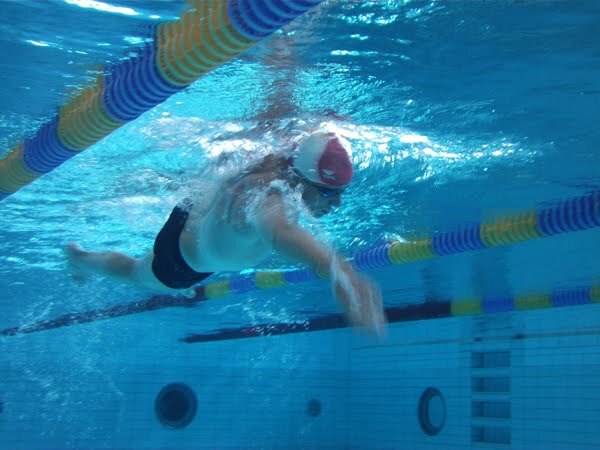 You can't go wrong, if 50% of your swimming workout is composed of miscellaneous swimming drills. So happy drilling everybody! Swimming in college in the USA - Do you have what it takes? Learning to swim at an early age can have many more advantages than just mastering a necessary water survival skills. It could for example lead to a longer term swimming career which will affect ones life even if they do not plan on it. Sure, not everyone will be in the Olympic ranks with Ryan Lochte, Alexander Popov, Ian Thorpe or Michael Phelps, however, if some swimming dedication is present in a person, it is not unreachable to pursue swimming at a collegiate level. There are many collegiate swimming levels and therefore many opportunities for a swimmer to take part in this wonderfully competitive sport. However, as it is with every good thing in life, swimming in college also comes with a price. More about what it entails to be a swimmer in college from Marina. If you're considering participating on a swim team in an American college or university, more power to you. There are, however, some issues you should weigh before taking that literal plunge. Being on a collegiate swim team has tremendous advantages and positives such as team comraderie, but it also demands hours each week in the pool and away from your free time in addition to time in the library and taking online college classes. If you or your child is considering swimming in college, please understand that it requires a firm commitment in order to excel. Moreover, if you're thinking about going pro, swimming in college is invaluable and depending upon your individual event(s), may require you to swim 7,000 - 10,000 yards (~6500 - 9000 meters) or more each day. So what are the ups and downs of swimming in college? You'll have to wake up well before any of your other fellow students, for starters. Swim practices typically begin at 6:00 AM sharp. For many students, this means no late-night partying, but instead going to bed much earlier than everyone else because it’s guaranteed you will need that rest for the morning training. A typical morning swim workout will consist of roughly 3,500 yards (3200 meters) of swimming over the course of 90 minutes. However, don't despair, you will not have to do this alone. A plethora of devoted teammates will keep you company and will not hold back any sly remarks about your morning hairdo. Not only will you have to get up before the crack of dawn, you’ll have to participate in yet another training session later in the afternoon for another swim team workout. By committing to swim team training five or six days a week and three or more hours each day, your social life outside of the swim team will be severely impacted. You also have to be careful about choosing the right foods, especially before a big competition. There is no question being a competitive swimmer in college requires an enormous commitment on your part but there is an upside to all of these countless hours of training in the pool. The big positive is that you have the sense of pride of being a college athlete and excelling at what you love. Because you'll be paying careful attention to your nutrition needs, you'll also very likely be much healthier than your partying friends. If you search hard enough and apply yourself, you might even score a swimming scholarship, so your tuition fees will be cheaper. The luxury of traveling to meets means you will be able to see many places throughout the country that you might otherwise miss. For elite collegiate swimmers, this can even mean travel to other countries. As an example, if you are an elite swimmer you can compete in one of the premier swimming events in the Pan American Games, this year’s event to be held next month in Guadalajara, Mexico. If you excel in elite swim events such as the Pan American Games, the NCAA Swim Championships, and other top events, you might even have the honor of representing your country even further by swimming in the most prestigious swimming event of all, the Summer Olympics (held next year in London, England). Many world-class athletes dream about the incredible honor of standing on the Olympic podium and receiving that coveted gold medal while representing their countries. While as a college athlete your status has to remain as an amateur in these competitions, you still can earn many other rewards including endorsements from sport companies and others sponsors, which can kick off an ongoing professional athletic or other career. Beyond your collegiate career, you'll have gained immeasurable experience in swimming and fitness from your coaches and peers as well as life long skills such as ability to perform under pressure, ability to work on a team or ability to pay attention to detail (if you work on perfecting your swimming technique). All of these skills become an advantage after the college education is finished and decision to pursue ones career path has to be made. Especially, if you choose to pursue a career of coaching, collegiate or otherwise, swimming in college is invaluable. Perhaps most rewarding of all, incorporating swimming into your life after college might grant you the distinction of working in field you truly love and can enjoy for the rest of your life. 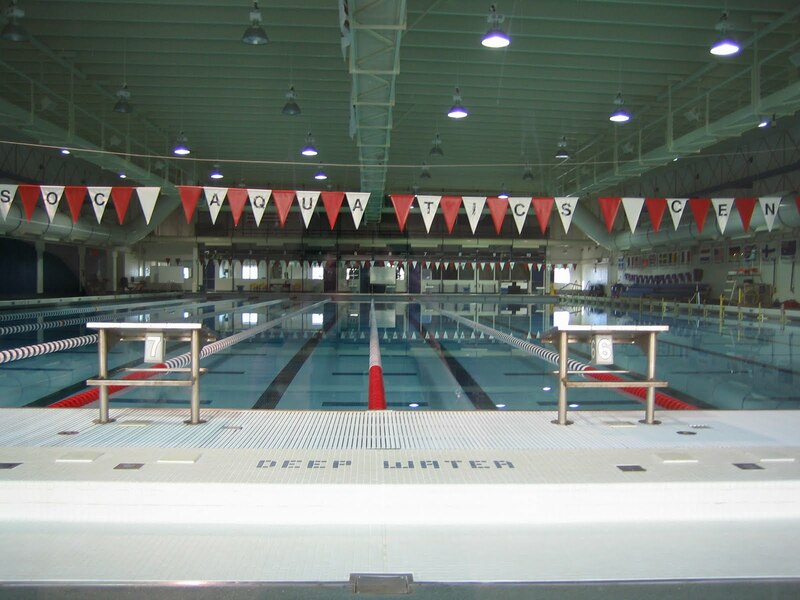 From Swimator Blog: If you are interested in swimming in college and what you read above scares you as it feels like a lot of work. Stop and think of it this way, many millions of students have done this before you, so it cannot be all that bad. Yeah sure, swimming at a university requires some dedication and commitment, however, the benefits of life long friends, skills and attitude by far outweigh it all. If it would be easy, would you get as much out of it? Probably not :). If you are considering swimming in college, learn more about your scholarship opportunities. Outdoor swimming can be a bit of a shock for people moving from the swimming pool for the first time. After all, the pool is nice and safe, with enclosed sides, a non-slip surface and everything you need on hand. In fact, maybe it's a bit too tame during the times when the public decides to stay home instead of swimming with you! If you're ready to get wet and wild and make the move to the great outdoors, then follow these tips to get the most from the experience while still staying safe. This is a guest post from Dee Mason, a sports and fitness enthusiast who looks forward to the Olympics in her home city, London, next year. She can frequently be found punishing herself in the gym, with cycling and swimming being particular areas of interest. The pool may feel chilly when you first jump in, but it's positively toasty compared with lake or river water, especially outside the summer season. If you're swimming in cold water, you'll be at risk of hypothermia if you stay in too long. So, it might be a good idea to measure the water temperature before you jump in. If the water is not too cold for you, you should still pay attention to the warnings your body gives you to avoid trouble. If your teeth are chattering and you start to shiver it's a sign that it's time to get out of the water. Change into warm, dry clothes, drink a hot tea or soup which you brought in your thermo bottle and warm up by running, doing star jumps (jumping jacks) or press-ups (push-ups). You can, however, increase your water time by investing in a good wetsuit which will also improve your buoyancy, so you won't have to work so hard during your swim. Get a swimming wetsuit (or triathlon wetsuit) for maximum flexibility when swimming. And when it's really cold, it's wise to cover your hands and feet with neoprene boots and gloves, even though swimming with booties might not be the most efficient way to get ahead. If you opt into booties you might want to also use fins, so you get some extra propulsion. For some crazy, cold temperature swimming, check out the Ice Swim in South Africa video below. Unlike pools, lakes, rivers and seas don't have convenient markings to let you know how deep you're getting. In fact, they may have no safety features at all. That means it's up to you to look after your own safety. When you step into the water, the bottom may drop away sharply once you leave the shore, so don't get taken by surprise. Checking the depth of the water is also important if you're planning to jump in or dive. Many of the worst swimming accidents are caused by people hitting their heads on rocks or jarring their necks and spines. And watch out for slippery algae covered rocks, too. Bare feet or a rubber grip shoe are the best footwear for an outdoor swim. Lakes may also be wider than they look, so make sure you have built up some stamina so you don't get stuck half way across. If you're swimming in a river or in the sea, then watch out for fast moving currents such as the rip current - you don't want to be dragged downstream or out to the horizon. In lakes, it's algae you have to watch out for. This green scum isn't nice to look at and can cause eye irritation and skin rashes. If you spot algae, swim somewhere else. Another lakeside hazard is swimmer's itch. Caused by contact with the snails that live in marshy lakes, it's harmless but unpleasant, making you itch for up to two days. Rats are responsible for another water-borne hazard. More specifically, their urine may carry Leptospirosis which, if left untreated could turn into Weil's Disease - and that can be fatal. If you're swimming in an urban area, especially after heavy rains, and get symptoms like flu or jaundice 3 -14 days after an outdoor swim, get a Leptospirosis test. If you have it, antibiotics will soon take care of the issue. These may seem like a lot of rules, but they are the best way to stay safe and if not taken lightly they will contribute to your outdoor swimming enjoyment. However, don't forget to have fun. Swimming outdoors offers unparalleled opportunities to get close to nature - you might as well enjoy it. From Swimator Blog: If you are only a pool swimmer, you should consider venturing out of your comfort zone and explore the unexplored. 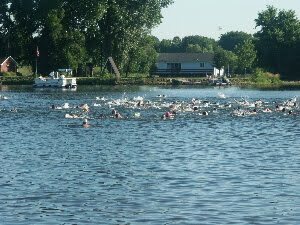 Outdoors or open water swimming is a great rush and usually much more enjoyable on a nice day in a nice water. You do not need to go into extremes as the guys in the Ice Swim Africa video, but throw in an open water swim here and there. You will see that you'll get hooked. We have literally thousands of lakes in Finland, some even with no boat traffic, so getting out there for a swim in a warm summer day is just priceless (I have not tried the ice swimming yet). Don't take my word for it. Try it yourself! Getting more propulsion during a swim is a huge problem for many swimmers and even more advanced individuals shouldn't stop exploring their stroke for potential improvement in propulsion. Actually, nobody should ever stop improving their stroke, no matter how good a swimmer they are. It is one thing to reduce drag by streamlining your body or strengthening your core to keep a nice and straight body line. However, it is a whole other ball game to increase your propulsion to swim at a higher speed. There are two main ways a swimmer can increase his/her propulsive power. Let's just assume I am not talking about increasing your strength in core body and other swimming related muscles in the gym with the aim of getting stronger in the water to generate faster arm movements (also called turnover or stroke rate). Instead, I am referring to changes in your swimming stroke that, allow you to generate more propulsive force and thus swim faster. One way to move faster through the water is by utilizing your arms to catch/pull more water. As it is with many aspects of swimming, there is a piece of equipment which helps to guide your arm, specifically the forearm, in the right direction so you get more out of your arm movements. Say hello to my little friend the "TechPaddle (Early Vertical Forearm Trainer or EVF Trainer)" (not to be confused with Speedo's totally different and not so useful IM tech swim paddle). If you read this swimming blog regularly, you might notice I do not recommend using too much swim gear unless it has a particular purpose, be it technique related or keeping your swimming workouts boredom free. Not too long ago I was raging about the triathlete community and how using paddles to swim with a bad technique is a really bad idea. TechPaddles, along with the AntiPaddles invention, however, do not fall into this category as they are no ordinary paddles. In fact, the word paddle in the TechPaddle name is probably not the luckiest branding effort as TechPaddles are not used for paddling to make you go faster or to exert more power in your stroke. Without seeing or reading any instructional materials, many swimmers could initially get the wrong idea about the TechPaddle. TechPaddles could be perceived more as very light braces for your forearms which keep them in the right motion for the swimming stroke. Perhaps a different name like "Catch Master" or "Extreme Catch" would be more appropriate. However, since the word paddle is so universal and very well known in the swimming community, it is catchy. What are TechPaddles and what do they do for you? TechPaddle can be also called the Early Vertical Forearm Trainer. 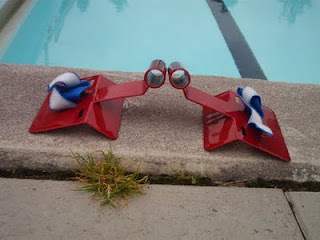 As the name suggests this unique swim equipment encourages the swimmer to keep the elbow nice and high during the initial catch phase of the freestyle stroke (or any other stroke for that matter). The EVF (Early Vertical Forearm) is a very difficult motion to master as it requires strength in muscles you don't even know you have. The TechPaddle will help you strengthen the right muscles and will also move your forearm in the right position. As with any swim equipment, this swimming product will not do the work for you. You, as a swimmer, still need to think about the proper hand/forearm coordination in the front of your stroke, however, the TechPaddle will help you remember and will make it easier for you to do so. The TechPaddle is made out of a very light and fairly flexible material which is a bit of a change from the regular heavy duty paddles as we know them. 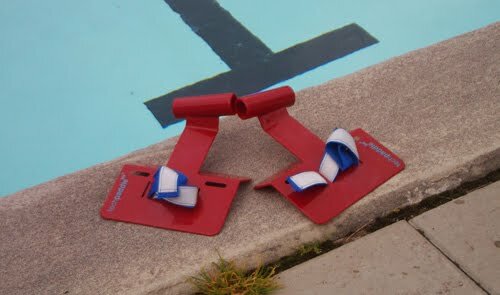 Also, what is different is the attachment that secures these paddles to swimmer's hand. In regular paddles, there is usually rubber tubing that attaches to the swimmer's fingers and wrists. However, in the TechPaddle the attachment is made by a velcro strap that wraps around the wrist. I have to say that putting on the paddles is not as quick as with regular rubber tubing, however the TechPaddle is so much more secure and can be used in other ways than just for the early vertical forearm catch training as intended (see bonus section below :)). So, in the TechPaddle design, this is definitely a huge plus. The front of the paddle has a tilted tube like structure which allows for a nice and relaxed grip in the swimmer's hand. This is also totally different to the more traditional paddle where the hand is placed flat on the paddle. Furthermore, the front tip of the paddle does not start at the swimmer's finger tips but at swimmer's wrist and it is not straight. 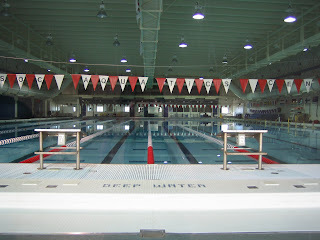 The front part of the TechPaddle is bent down towards the bottom of the pool. Finally, the paddle part itself snugly touches the swimmer's inner forearm instead of sitting on the palm as in the traditional paddle style. The TechPaddles come in a nice small mesh bag and with an educational DVD made by the product inventor Coach Tom Topolski who gives a very nice introduction to the strengths and usage of the paddles. Every time I watch Coach Topolski's high energy delivery I itch to jump into the pool and have another smart training sessions with the TechPaddles.:). The TechPaddle is not a one size fits all product (that does not really work with swimming equipment and don't let anybody tell you otherwise). It comes in three sizes to fit shorter or taller swimmers. What do TechPaddles do for me? Ordinary paddles focus on generating propulsive power with your palm by increasing its surface. With TechPaddles, most of the paddle surface is on your forearm and your hand is closed around the front stub, so your forearm is forced to do most of the work. In a way, the principle is very similar to the AntiPaddle, however, with the TechPaddle, your wrist is nice and stable since the paddle spans from your hand to the middle of your forearm. This allows you to focus on increasing your underwater forearm catch instead of only the hand catch. You have probably heard the term muscle memory where repetitive movements get ingrained into your brain and, after a while, you do not have to even think about the motions as your body will just perform them. In the same manner, the TechPaddle helps you to get rid of dropped elbow syndrome by constantly driving your hand underneath your elbow. Remember the front ledge of the paddle which is like an incline instead of being flat? This part of the paddle is responsible for pushing your hand deeper into the water and rotating it, so your palm faces to the rear of your body sooner. The earlier you get your palm facing backwards and underneath your elbow, the more powerful front catch you will have and the faster and more efficiently you will swim. Ideally, all this happens in front of your shoulder and not after your arm has passed the shoulder area, otherwise you are loosing the advantage of the early vertical forearm. One thing I have to stress though, is to make sure you swim slowly with TechPaddles as they are not meant for fast swimming. Make every stroke count and move your arm through the water in a nice and smooth early vertical catch. It might feel a bit awkward and you will have to adjust a few things at the beginning, but trust me if I tell you that it is all for a good cause :). Interestingly, since the TechPaddle attaches with a velcro strap to swimmer's forearms, it is possible to use them to swim in the opposite (backward) direction. What I mean is, instead of pushing backwards on the paddles with the palm and the inner forearm, turn yourself around with feet first and push forward with the top of your forearm and the top of your hand. Ordinary paddles do not allow for this as the rubber tubes are too stretchy and would come out in the reverse pressure scenario. I will not get into details on how to swim backwards freestyle in this article, but stay tuned for more detailed tutorial. Swimming backwards is an awesome way to work on keeping a straight body line and on awareness of what your body is doing in the water. I think the TechPaddle is must-have swim gear in your swim bag if you are just starting out in your swimming technique adventures or would like to move into open water or triathlon swimming. I really like the design and the way the paddle attaches to the forearm, however, if I were the inventor, I would not make it so wide as it could cause you to feel a bit awkward at the beginning of your TechPaddle training. Everyone likes to swim faster and win over competitors, however, not that many of us like the hard work which this entails. The TechPaddle might just be the answer to get you swimming faster without having to work very hard. So, this is your chance to get on the Free Speed train and swim smarter, not harder :). Please join our growing Swimator Facebook community or follow us on Twitter @360swim.